WILLIAM HARLAND was probably born in Whitby around 1739. William was a butcher and farmer. ANN DICKINSON. Her age at death gives her a birth date around 1730. Since the couple called their second son Francis, it is highly likely that hers is the baptism in Whitby of Ann, daughter of Francis Dickinson on 1 May 1730. Her father was a farmer at Whitby Laithes. This was formerly a grange (outlying farm) of Whitby Abbey. Her mother was Elizabeth Burn of Fylingdales, south of Whitby. She was the eldest of three daughters. Before she was ten, the family moved further south to a farm at Gnipe Howe, near Robin Hood’s Bay. Her grandfather was living with them. The fishing town of Whitby is famous for its abbey, its kippers and the jet found on the beach. Whitby. Photograph Frank Meadow Sutcliffe. The Church is on the left of the skyline, the Abbey on the right. Ann Dickinson married William Harland in Whitby, 16 April 1758. That year Halley’s comet was seen on Christmas Day. Eight children were baptised in Whitby. Two of them died in infancy. For the first six, the family are living at Hawsker, a village 4 miles SE of Whitby, a mile from the coast. John, 8 Apr 1759, born 19 Feb. Father: Farmer, Hawsker. Francis: 14 Sep 1760, born 10 Aug. Father: Farmer, Hawsker. Thomas and Margaret: born 19 July 1762, bapt 29 Aug 1762. Father: Butcher, Hawsker. Margaret died the following year and was buried on 19 April 1763. Her father is again described as a Butcher. Dickinson: 30 Sep 1764, born 7 Aug 1763. Father: Farmer, Hawsker. Ann: 26 Oct 1766, born 24 Aug. Father: Farmer, Hawsker. Sometime in the next two years, the Harlands moved to Knipshaw. This has not been found on the Ordnance Survey map. It may have been in the region of Gnipe Howe, halfway between Whitby and Robin Hood’s Bay, and close to the coastal footpath. If it was nearer the cliff edge, it could have fallen into the sea, which is seriously eroding this coast. A second Margaret was born there. Christopher born 17 Feb 1770, bapt 15 April. Father: Farmer. Knipshaw. Christopher was buried four days later, on 21 Feb. 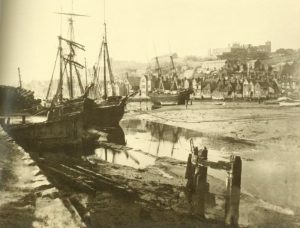 In the latter half of the 18th century, Whitby became a major whaling port. Ann junior died aged 16 and was buried on 29 Sep 1782. Ann senior was buried on 10 Mar 1813, aged 83. She was still living at Knipshaw. William’s may be the burial on 13 April 1819, aged 80. If so, he was living in Whitby, possible being cared for by one of his children. Their eldest son John was living in Hawsker when he died in 1831. It is likely that he took over the family farm. Their son Thomas became a cabinet-maker.